‘MicroCharity’ is a humble initiative to bridge the gap between the rich and the poor, to make the world a better place to live in. A magnitude of people who deserve help, and another magnitude of generous people with a desire to help. ‘MicroCharity’ is just a platform where both meet. The first seeds of MicroCharity were sown in September 2002 at Bangalore when 10 individuals and a priest came together to form a prayer group. Right from the inception, we were working on charity activities, but soon discovered that ‘the harvest is plentiful, but the workers are few’. And then we prayed to the Lord of the harvest and thus ‘MicroCharity’ was born. In over 10 years the group has grown to 14 families and a priest. Now scattered across the globe as working professionals, but we still come together to work for MicroCharity. Fr. Bitaju Puthenpurackal, O.SS.T. 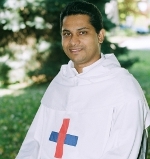 is a religious priest of the Order of the Most Holy Trinity (Trinitarians). He also closely works with an international Youth Movement called Jesus Youth and currently serves as the International Pastor of Jesus Youth. Benson Jose & Rani live in Houston, Texas. They are blessed with three kids – Emmanual, Paul & Abel. Benson works in the IT industry and Rani is a registered nurse. Biju George & Jinsha live in Kochi, India with three children – Joshua, Christina and Jeremia. Biju is an entrepreneur and has co-founded Lenvica Computer Solutions Private Limited, an HR Software Company. Jinsha works in the same company as a Software Engineer. Binoj & Deepa Mathew live in Cincinnati, Ohio. They have 3 children – Joel, Anne and Christa. Binoj is an IT Project Manager and Deepa is a Family Nurse Practitioner. 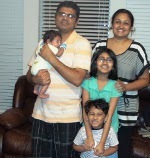 Binu Martin Joseph and Aji live in Houston with three children – Joan, Jayden and Jacob. Binu is an engineer and Aji is a registered nurse. Cyril & Reni live in Raleigh, North Carolina with their two kids Edwin and Johan. Cyril is an IT Professional and Reni is a registered nurse. Deepak Joseph & Mary Pius live in Bangalore. They have two daughters Hannah Maria and Diya Bridget. Deepak works as Manager – Engineering, in Faurecia Emissions Control Technolgies , Bangalore Technical Center. Mary Pius is a lecturer by profession. Hannah and Diya are students in Christ Academy Bangalore. Jimson Mathew & Lighty live in UK with their son Leon. Jince & Babitha live in St. Paul, Minnesota. They have 2 children – Johan & Hannah. Jince works for Cognizant as a Tech lead and Babitha works for Infosys as a technical test lead. Jisso Jose & Merin live in Bangalore with their 3 kids, Sneha, Sophy & Steve. Jisso is an entrepreneur and was part of multiple start-up initiatives. Currently he is Managing Director & Founder at Totient Business Solutions, a Product Engineering company works in the area of Digital Marketing & Big Data. Merin is a Asst. Professor at Christ University – Faculty Of Engineering. Dr. Manoj Mathew and Jins live in Kanjirappally, Kerala, India with their two children Liza and Joe. Manoj is a Paediatrican and works in Mary Queens mission Hospital, Kanjirappally. Jins is a Software Engineer and works for IBM Bangalore. Melvin & Jincy live in Austin, Texas. They have 4 children – Felix, Sarah, Carol and Laura. Melvin works for Mphasis as a Sr Manager and Agile consultant. Jincy is an IT professional and transitioned as a home maker, busy managing her 4 children. Seby Kallarakkal & Nancy Seby live in Bangalore with their son, Nikhil and daughter, Nina. Seby is an entrepreneur, who started Nabler, a digital analytics company in Bangalore. And Nancy works at Flatworld Solutions in online marketing. Shino Thomas & Shallet live in London with their daughter Sharren (Kunjatta). Both of them are in to software profession. Tito Mathew & Rosemary are settled at Changanacherry, Kerala, India. They have 3 children Mathew, Thomas and Rita. Tito Mathew is promoter Director to AMJ Stock Brokers Pvt. Ltd., a Porfolio Management Service and Financial Planning company known as AMJ STOCKS. Rosemary is a homemarker.